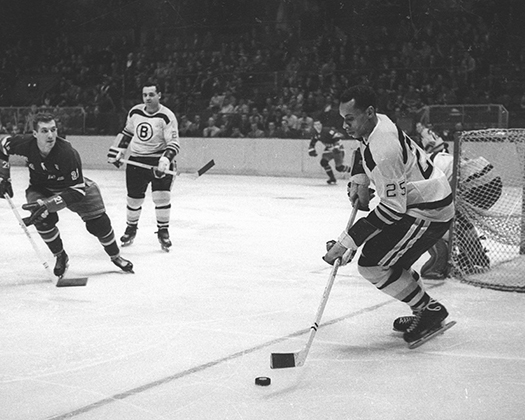 Scattered among the artifacts and mementoes dotting the walls of his USA Hockey office, one of Lou Vairo’s most prized possessions is a grainy black and white photograph of Willie O’Ree in action during a National Hockey League game. What makes this image so special for USA Hockey’s director of special projects is not just that O’Ree, the first black player to skate in the NHL, signed the photo to his “dear friend,” but Vairo was at Madison Square Garden on that particular night, and still remembers it like it was yesterday. A roller hockey player growing up in Brooklyn, N.Y., Vairo tried to persuade his black friend Ralph Dease to join his team in 1960. So they hopped the bus and paid 50 cents each to watch the Bruins play the Rangers with a particular focus paid to O’Ree. “Ralph joined our roller hockey team the next day,” Vairo fondly recalls. It wouldn’t be the last time Vairo recruited minorities into the game he loves. 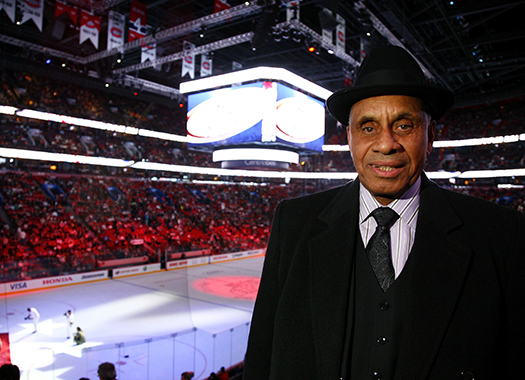 After breaking the color barrier in 1958, Willie O'Ree has spent the past 16 years promoting the game to children of all ages and backgrounds. The story of O’Ree becoming the first black player in the NHL is an important part of hockey heritage, but the work done by dedicated volunteers at the grassroots level is the real untold story of breaking down the barriers that have historically kept minorities off the ice. Like most hockey accomplishments, the creation of the program was a team effort. The first meeting took place in Boston in 1993 at the prompting of NHL Commissioner Gary Bettman and USA Hockey’s Executive Director Dave Ogrean, and included Vairo, Bryant McBride of the NHL and a number of individuals who were already running programs in inner cities around the country. Great things were already being done by the Jack Adams program in Detroit, the Mariucci Inner City group in Minneapolis, New York’s Ice Hockey in Harlem and the Ft. DuPont program in Washington, D.C., but this brainstorming session was as much about sharing ideas that worked in their respective communities as it was about what else could be done to open the game to even more inner city kids. It was something that Bettman and the NHL cared deeply about, and they found USA Hockey an eager partner in creating a system of working together to break down the barriers into the game, whether it was equipment procurement, ice rental or explaining hockey’s foreign culture to inner city kids and their parents in the hopes that they would give the sport a try. “And it wasn’t about the NHL writing big checks,” says McBride, the NHL’s director of new business development, who along with Vairo, was the driving force behind the program. At one point during the meeting, the conversation turned to Jackie Robinson, who broke baseball’s color barrier in 1947, and someone wondered aloud if the day would ever come when hockey would have its own pioneer. That was Vairo’s cue to regale them with the story of O’Ree. Born in Fredericton, New Brunswick, O’Ree, the youngest of 13 children, grew up with the same aspirations of most Canadian youngsters of playing in the NHL. The thought that no other blacks were in the league was not going to slow him down. Then, when he was playing in a Junior game with the Quebec Aces, a slap shot deflected off an opponent’s stick and struck O’Ree’s face. Having lost 95 percent of his vision in his right eye, doctors told O’Ree that his hockey career was over before it had even begun. When he returned to the ice several months later, O’Ree learned to compensate for his lack of vision and continued to impress scouts and was eventually offered a tryout with the Bruins. Several years later, on Jan. 18, 1958, O’Ree would make history when he suited up in an NHL game at the hallowed Montreal Forum against the Canadiens. That’s the message O’Ree continues to preach now in his 16th year as the face of the NHL Diversity Program. “Willie is the epitome of Hockey is for Everyone, and that it’s an inclusive, great sport that every kid should have the opportunity to play,” says McBride, who hired O’Ree at Vairo’s bequest. 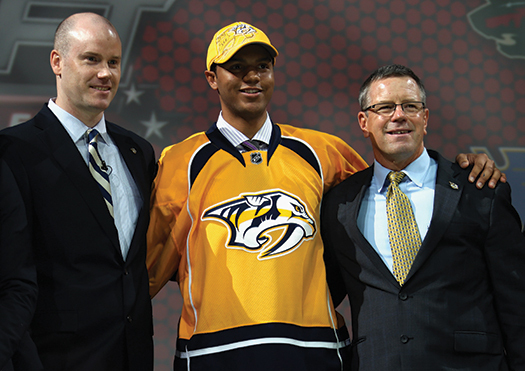 Seth Jones (middle) was the first African-American drafted in the first round. O’Ree’s NHL career lasted only 45 games but his impact on the game is still felt today. He helped open the door for the next generation of minority players who would leave their mark on the game. Among them were Grant Fuhr, who backstopped the Edmonton Oilers to four Stanley Cups; Jarome Iginla, a member of the 2010 Olympic gold-medal winning Canadian Olympic Team; and Mike Grier, who played more than 1,000 NHL games. The son of an NFL executive, Grier grew up in a small suburb of Boston and began playing when he was 5. With the size and determination to knock down any barrier in his way, Grier worked his way onto the Boston University squad that won the 1995 national championship and eventually into the NHL. Like O’Ree, Grier said the racism he encountered while playing youth hockey was not enough to stop him from achieving his dreams. To its credit, the NHL has taken an active role in promoting diversity throughout the league. Each player is required to enroll in a diversity training seminar before the beginning of each season as the league has consistently sent a strong message that racially-motivated verbal abuse will not be tolerated. “A kid just wants to play hockey, he doesn’t care about the color of his skin or how much his parent is paid,” says Neal Henderson, who was awarded the Wm. Thayer Tutt Award as USA Hockey’s most outstanding volunteer in 2007 for his work with Ft. DuPont Hockey. Now it’s time for the next generation to carry that puck forward. And there are a number of great players poised to do that. Among them is Seth Jones, who made history as the first African-American selected in the first round of the 2013 NHL Entry Draft. The son of former NBA star Popeye Jones, the Dallas native chose hockey at an early age and quickly caught the eye of pro scouts with his size and athleticism. And while many have focused on the color of his skin, Jones is hoping that his play on the ice and the way he carries himself off it will help others see him as just another hockey player. “I want to be looked at as someone who has good character, and people know me for the person I am, not my color,” he says. Still, Jones understands that his presence in the game can inspire other little boys and girls to give hockey a try. “Anytime I, or anyone, can help to get kids into the sport of hockey – or any sport, as a matter of fact – it’s huge,” he says. And while playing in the National Hockey League provides great exposure, it pales in comparison to performing on the biggest stage in sports, the Olympic Winter Games. Both Jones and Dustin Byfuglien, a Minneapolis native who won the Stanley Cup with the Chicago Blackhawks in 2010, are candidates to play for Team USA in Sochi, Russia. On the horizon stand other talented players, such as Jordan Samuels-Thomas, who helped lead Quinnipiac University to the NCAA title game, and Keegan Iverson, who was named Player of the Game at the 2013 CCM/USA Hockey All-American Prospects Game in Pittsburgh. Since its inception, the NHL Diversity Program has provided more than 40,000 economically disadvantaged boys and girls of all ages with the opportunity to play hockey. But even those who have worked so diligently on the front lines acknowledge that there is still a long way to go. The game needs even greater exposure in the inner cities if it is going to compete with sports like football and basketball for athletic talent, whether that means more role models or greater exposure through television. Still, few doubt that the day will come when an African-American athlete will bridge the cultural gap in hockey the way that Tiger Woods has done in golf. When that day comes, the sky’s the limit for how far the game can go in the United States.